Raoul Wallenberg by Peter Malkin. “We are the only two organizations in the world to honour the Righteous in all genocide cases” said Baruch Tenembaum, the creator of International Raoul Wallenberg Foundation, in the opening of the encounter – held on March 19 in Milan – with Gariwo founders, Gabriele Nissim and Pietro Kuciukian. Just a few words that convey the reasons that moved him to face the long journey from Argentina with the willingness to pave the way to cooperation between the two organizations. Born in a community of Jewish refugees fleeing 1880’s Russia pogroms base in the Santa Fe province of Argentina, Tenembaum is an energetic and jovial elderly. He gives the impression of combining a strong pragmatism with a sound humanistic education, and a glance at his biography confirms this. He studied Religious science and taught Yiddish literature and philosophy for many years. In 1964 he organized the Spinoza Congress, with the participation of Israeli prime minister Ben Gurion and writer J. L. Borges; the next year he was one of the promoters of the first visit of a Pope to Jerusalem. 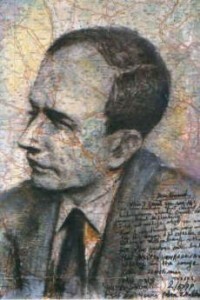 In 1966, he founded the international inter-confessional organization Casa Argentina, based in Jerusalem and Buenos Aires. A branch of this will become the International Raoul Wallenberg Foundation, named after the Swedish diplomat and philantropist passed away in 1945 – apparently captured and sent to a GULag by the Soviets – after rescuing thousands Jews in Nazi-occupied Hungary. IRWF, chaired by the Argentinian enterpreneur of Armenian descent Eduardo Eurnekian, was created with the aim of making the public opinion aware of the values of solidarity and civil courage, which are the ethical bulwarks of Holocaust rescuers. Yet, the founder cares about assessing “It isn’t an exclusively Jewish organization”. “We don’t lament, ours is a commitment towards the future, to the prevention of all cases of genocide and the education of the younger generations”. On his turn Mr. Eurnekian, on whom the Oslo Business for Peace Organization bestowed in 2012 the “Business for Peace Award”, underlines the need for unity – especially between Armenians and Jews – when acting to follow this engagement. Once the common goals with Gariwo were assessed, after expressing his own enthusiasm for the ideas at the basis of the Garden of the Righteous worldwide of Milan and the European day of the Righteous, Mr. Tenembaum raised with an initial cautiousness the delicate issue which whoever tackles the topic of the Righteous must sooner or later deal with: Yad Vashem. It is a “closure position”, in his opinion, the one of the Memorial of Jerusalem keeps towards the endeavour to work through the concept of Righteous. For example it is paradoxical that “the Jews cannot receive the title of Righteous among nations” and Yad Vashem should not claim to exert its monopoly on a concept – not simply a title, as underlined by Mr. Eurnekian – that appears both in the Bible and in the most ancient European cultural tradition. But the key element is the discussion on the term Righteous, for which purpose people shall use it and the different meaning nuances that it takes depending on translation. It is not only a matter of terminology – our interlocutors know – and one should speak the same language to understand eachother well and build common projects. Hence are the words righteous, rescuers, giusti, salvadores used to talk about whom? There are Righteous people who, without performing rescue deeds, have opposed moral resistance in the defense of human dignity, or risked their lives to witness to and report crimes. “I agree with you – said Tenembaum in conclusion – that in philosophical terms the salvadores are those who have safeguarded humanity values”. Pietro Kuciukian, who in Yerevan has raised a remembrance wall to honour the witnesses of truth against Turkish negationism on the Armenian genocide, knows it well. Peter Malkin, author of the portrait entitled as “With the same hands” (photo), was the Mossad agent who in May 1960 captured “with his hands” Nazi criminal Adolf Eichmann. A reproduction of this work was donated from our guests to Gariwo Chairman Mr. Nissim during his visit to our premises.